5 States, 148 Hiking Days, 25 Supply Points, 130 Maps and a Total of 2,414 Miles from Mexico to Canada! An avid outdoorswoman, West Point graduate and former Captain in the U.S. Army, Jennifer Hanson -- with her husband Greg Allen -- set off to thru-hike the 2,400-mile Continental Divide Trail. Together they traversed arid ranchlands of New Mexico, snow-capped mountains of Colorado, the Red Desert of Wyoming, and Glacier National Park of Montana. During their hike, Jennifer learned she had lost her father to cancer, and, within three weeks, her husband was forced to leave the trail due to an injured nerve in his foot. Jennifer finished the last nine hundred miles of the trail -- alone. 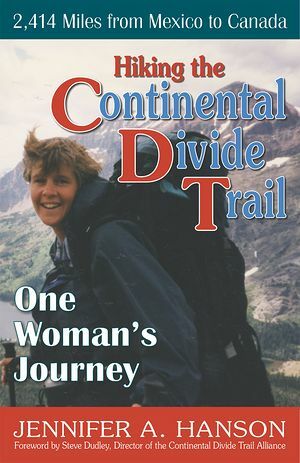 Hiking the Continental Divide Trails: One Woman's Journey is the story of their incredible summer and is filled with courage, humor, stunning scenery, local personalities and the simple joys of backpacking.